Man, I'm going blog crazy today. Look at all these posts, I don't know how I do it. Maybe because I'm too lazy or too busy to do this on some sort of regular schedule, then I dump a half a dozen on here in one day. 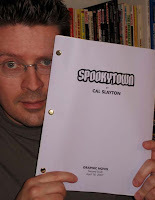 Anyway, just a quick update on how the production of my Spookytown graphic novel is going. It's going good. There. No seriously, I just finished the second draft, as seen here. The story has expanded from 60 pages to 66 pages since the first draft. A couple of scenes seemd rush before, so I fleshed them out. And I added one more scene to explain some things. My lovely wife and I are gonna give it another read through and then I may pass it on to a few friends to read, I'm no sure yet. But I think it's in pretty good shape. It's obvioulsy not gonna be the best comic book anyone's ever read because (and I'll repeat this to my grave) I am not a writer, I think it'll be a fun read. Also, I've been doing a lot of sketching in preparation for drawing the darn thing. I've been trying to nail down all the characters before I start in order to keep them consistent throughout the book. I thought I'm share some here. Below are a bunch of ones I recently did. 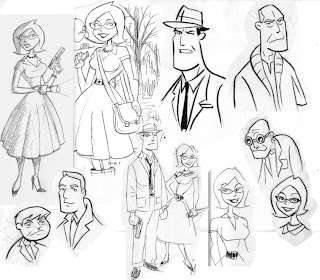 You can see the main characters Jack and Emma, also Jack's dad, his buddy Ben and couple of other folks too. Hope you dig 'em.